As Members of the Awards and Recognition Association (ARA), we are committed to providing the highest level of professional service. We can help you give the perfect award to all sorts of achievers. We offer you a large range of products, including sports trophies and employee recognition & corporate awards to suit all events. 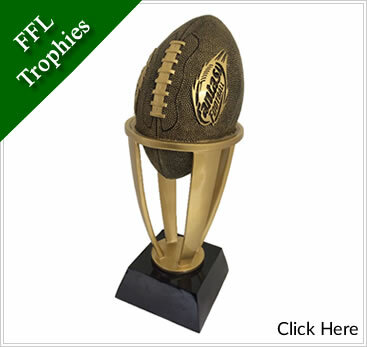 We have ranges of trophies and awards specifically for golf, football, baseball, lacrosse, basketball, soccer, as well as multi-purpose awards that can be customized to all other sports. We are a Custom Builder of Awards & Trophies. Normal turn around time on trophies is 24 - 48 hours. We can provide you with same-day service for those last minute decisions. With our in-house engraving department, we are able to cut the metal to size, engrave, and attach to the trophy without leaving the store. If you have a sport that you want to have an award for, come into our retail location and one of our sales associates will help you put an award together. Remember: Engraving is always included in our pricing on trophies. We will work with you to determine what looks good on your awards. Need some ideas? Browse our product image albums for plaques, acrylics, crystal, glass, trophies, and more.